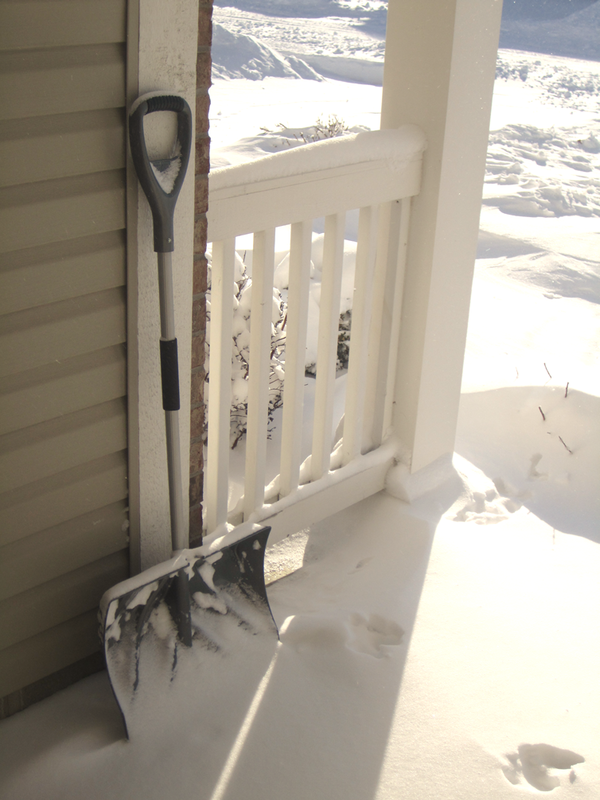 I don’t mind shoveling snow from my driveway… once. But come on, three times in a day? We get our share of snow in Indiana, but a whole foot in one day is… a lot of snow. But I had a plan. I figured that if I shoveled every few hours, it wouldn’t be so bad—shaving off a few inches at a time versus digging out of a buried mess. Thank goodness we have a normal-sized neighborhood driveway. And honestly, it wasn’t that bad. Until my third trip outside. I was pushing my shovel slowly down the driveway, scrrrrraping the snow from the concrete for the third time, sticking with my plan. Then, here comes my neighbor up the sidewalk with his monster-truck-snow- blower. Surely he sees me, right? Surely he’ll pause and let me go through, won’t he? The powder-storm shooting out of his machine must have made his sight lines a bit, well, non-existent, because he kept right on coming, on a collision course with me and my twelve-dollar plastic shovel. Stick to the plan, I mumbled. One of us was going to need to stop soon. And then all at once, his machine rolled over a crack in the sidewalk, causing the snow-blowing spout to jostle toward me, and you guessed it, I got a direct hit—flying snow, shot from a gas-powered cannon, all over me. So I stopped. So did my neighbor, the guilt slowly appearing on his face when he saw the splattering of snow all over mine. With the noise of his snow blower’s motor making it hard to speak, I gave an awkward “no problem” little wave and he moved on down the sidewalk. I wiped the snow from my face with a wet glove, and went back to pushing snow. Okay, brace yourself… that didn’t really happen. I kind of… twisted the real memory. What actually happened was, I was scrrrrrraping the snow from the concrete for the third time, sticking with my plan. My neighbor and his very normal-sized snow blower were working next door. I gave a cursory wave and went back to pushing snow. No collision course. No splattering of snow in my face. Just scrrrrraping the snow away. Kind of ho-hum, huh? Well, it was just that. 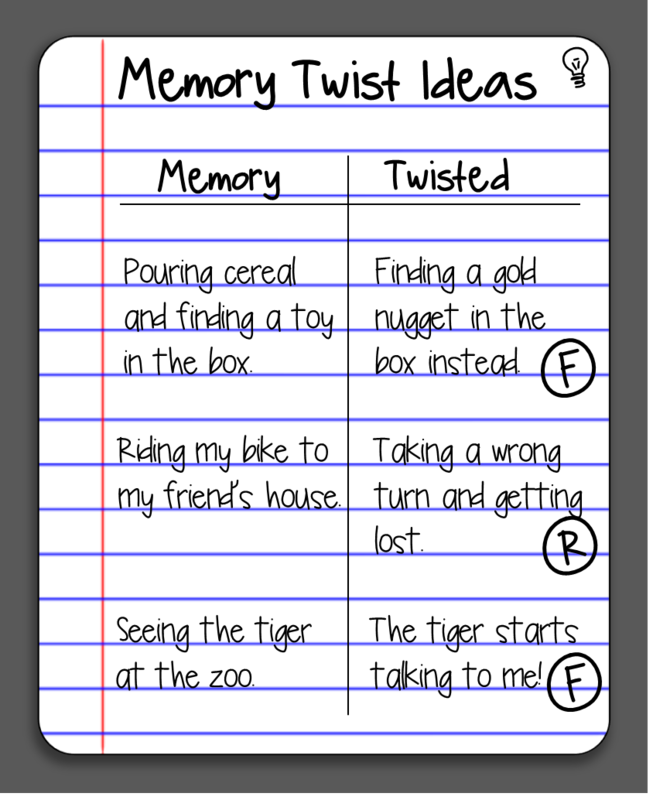 But it did give me time to think about a favorite writing lesson I use for story ideas: Memory Twists. I like to start with telling the class a story. I don’t even tell my students what we’re working on. I just dive right into telling them about something that happened to me recently—nothing fancy, just a ho-hum little memory. Kind of like what I did to you. And then I choose a moment to twist the memory into a story with more excitement, humor, or adventure. When I finish my story, and I have them all wide-eyed and intrigued, I come clean about the twist. They’re a bit shocked, but I’ve hooked them. Then I have to get something straight with my students. 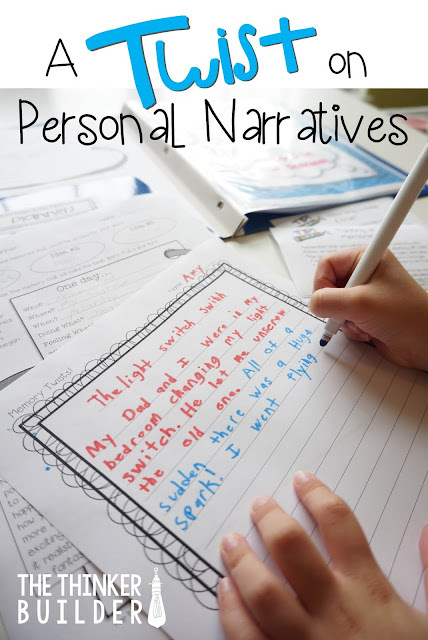 A personal narrative is a genre of nonfiction writing—it’s true stuff; it really happened. A memory twist is NOT a personal narrative. Sure, it’s a twist on a personal narrative, but students need to be clear that they are writing a fictional story, whether realistic or fantasy. Otherwise, it seems like we’re just being liars. Okay, time to get the kids brainstorming ideas. I have them set up a simple T-chart in their writer’s notebooks like the one in the picture above. Students list some “memory moments” on the left side. One of the great things about a memory twist story is that you don’t need to start with some special memory—a ho-hum one works just fine! 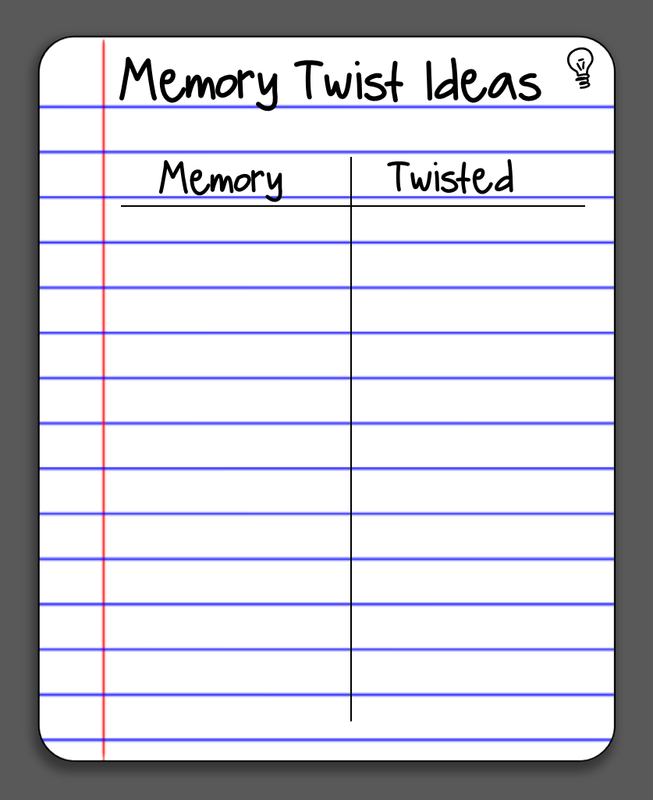 On the right side of the chart, students note an idea to ‘twist’ the memory. Table-group talking is definitely allowed during this time, as it usually gets those twisted ideas swarming. I also like to have them code each twist-idea with an “R” for “realistic” or an “F” for “fantasy.” See the example to the right. After brainstorming, I have students make a bullet-point plan, but with two different color pens or markers. They use one color to represent the “real” parts of their story, and a second color to represent the “made up” parts of their story. See the example. Students then use their two-colored bullet-point plan to write their story. 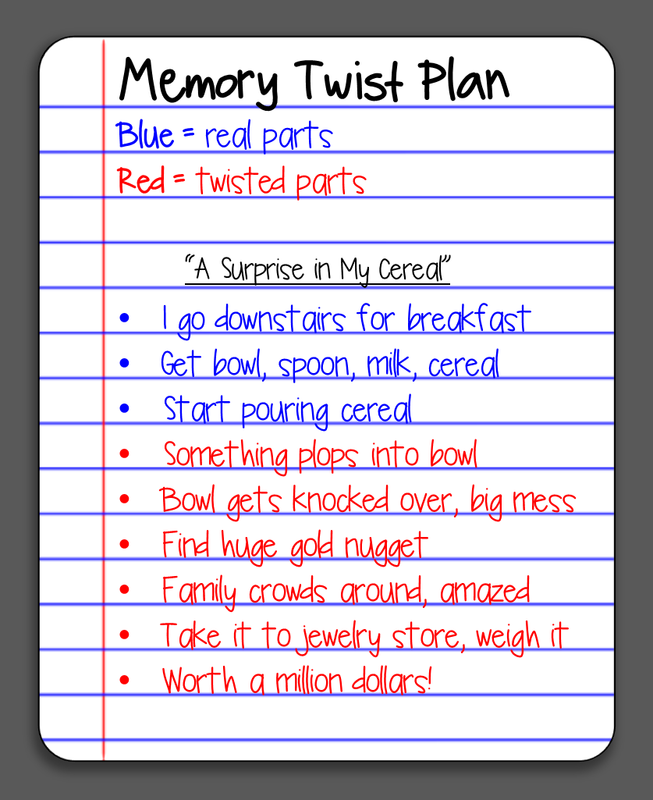 The Memory Twist strategy is often my students’ go-to source for story ideas. It’s fun, it’s freeing, and it usually makes for an entertaining story. Try it out! I've updated this lesson into a complete writing center. It is one of my "Keep It Fresh!" writing centers and is totally free! Click HERE or the image below to download it from my TeachersPayTeachers store! Or check out the huge bundle of ALL my writing centers, designed to be engaging for students and easy for you to keep fresh. Click HERE or the image above for more details.